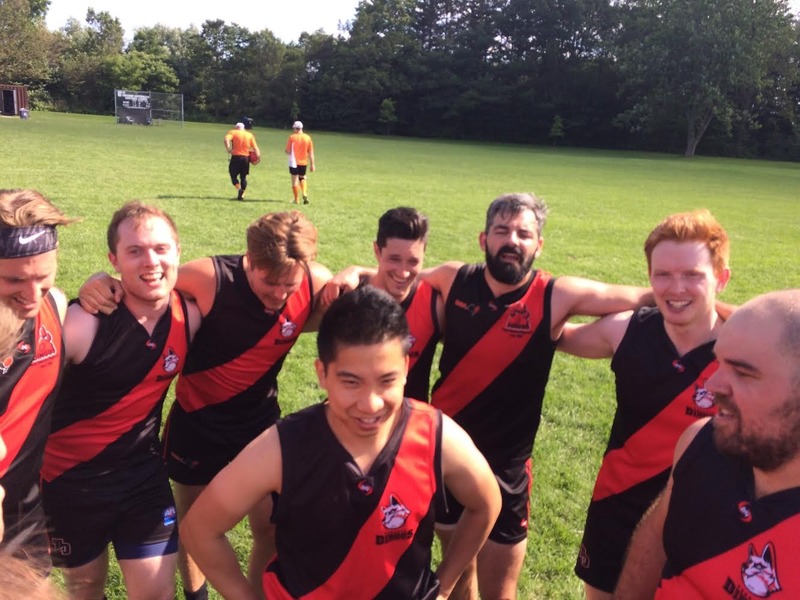 The Toronto Dingos took on the High Park Demons in AFL Ontario round 6 action on the weekend. In the season thus far both teams had extracted their sole wins against the Grand River Gargoyles and came into this one keen to right the ship. In the first quarter it quickly became apparent that this was going to be an arm wrestle of a game, with both teams quickly piling on goals, ending the quarter with four goals a piece. Just as one team would look to be on the ascendency the other would strike back. Dingos full forward Rob McNaughton showed off what he can do when given strong delivery of the football, ultimately netting seven goals for the game with partner in crime veteran Paul Tinkler getting a “standard” three of his own. Rookie Curtis Parker also accounted well for himself up front picking up a goal and taking a stint in the backline to help out defensively later in the game. Alongside Curtis in the half-forward line Ben Moller made a big impact in his first game with a number of big tackles and steadying kicks throughout. Without a number of their usual midfielders Dingos ruckman Steve Gordon supported by Justin Robertson, Tim Indian, and Mike Bocian had to fight hard for possession throughout this one in a see-sawing battle for the upper hand. The injection of Mick McFarlane off the bench proved invaluable as he worked to provide direction around and out of the ruck, with Michael Mcmurrich providing support and relentless run fromthe wing, getting a lot of the football as a result. In the face of the back and forth nature of the game the Dingos backline were frequently under pressure and accounted well for themselves. Greg Gilbert and Mike Karas made a number of crucial goal saving tackles and forced behinds throughout that ultimately would prove the difference when the final siren sounded. Greg was awarded the Paul Tinkler Pewter for best on ground for his relentless defensive effort. The pattern established in the first quarter continued throughout the first three, with the two squads coming into the final quarter with the game still hanging in the balance. 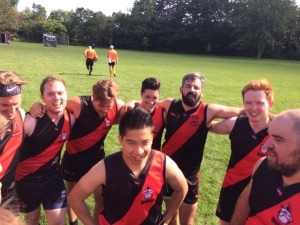 The Dingos were better able to lock things down in the ruck in the late stages of the game, nullifying the Demon’s attempts to get quick ball and establishing a small lead kicking out with a few goals in relatively quick succession. The Demons fought back with two of their own but ultimately ran out of time. The Dingos prevailed 14.2-86 to 11.8-74 getting a much needed win as they prepare for their annual regular season road trip to play the Ottawa Swans on July 15th.